Since the launch of monkkee, we have been concerned with the question of whether or not monkkee needs a dedicated mobile app. Apps are still very popular, they are often faster than web applications and they can be distributed easily through app stores. Several of you have written to us, asking whether we had any plans to develop an app. And yet, we couldn’t bring ourselves to do it, and, as things stand, nor are we going to launch an app in the near future. Why? Apps are perceived as convenient. You’re not required to log in each time, can just quickly jot down a note… But staying permanently logged in would have serious security implications. Sometimes, we hand our smartphones to friends or family members as we show pictures or videos. Your private notes would be accessible with just two clicks, and this would go completely against the purpose of monkkee, which is to guarantee all users ultimate security for their journaling activities. To develop a mobile app costs about as much as a small car. While we have expertise in developing software, our focus lies primarily on the development of web applications. A mobile app development would represent a major investment for us. While apps can bring money, the achievable prices are typically between 0 and 5 euros. monkkee’s user base is not yet large enough to bear the costs. Ultimately, we would pay the major part out of our own pockets and this is something we simply cannot afford at the moment. monkkee is free of charge and donations are voluntary. We fully support this concept, but as a consequence, our financial scope is limited. monkkee works with all common mobile browsers. 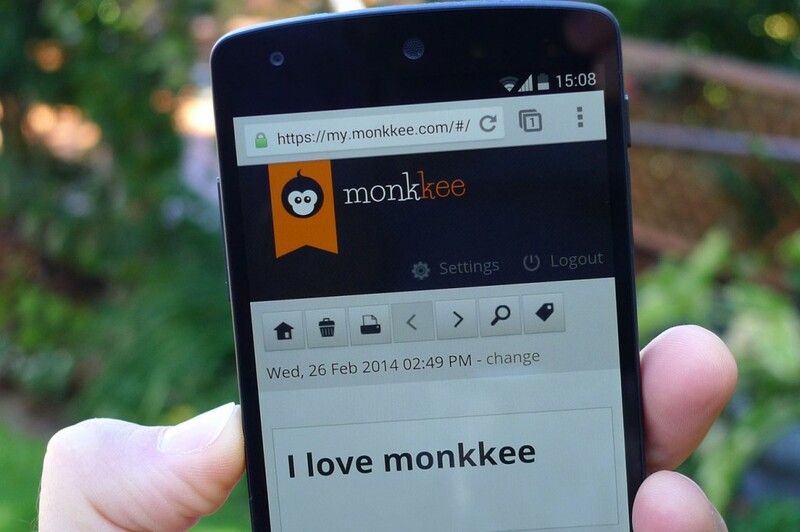 From day one, it was possible to use monkkee on smartphones and tablets. We frequently released updates to provide improvements and further optimise the mobile experience. Also, as mobile browsers become faster the performance gap between apps and websites is closing. We are aware that there are still some imperfections; especially on Windows Phone not every feature is optimally supported. Nevertheless, we are very satisfied and have removed the BETA label for mobile devices. From now on, you will no longer be in beta mode when accessing monkkee from your smartphone or tablet. What about other products ? – Evernote is very nice, has a lot of features but I DO MISS to have a password PER NOTEBOOK. Once you open the app (mobile or desktop) you’re completely exposed. However, I’m also a IT developer ! Mostly work with mainframes but all of our interface is web based. And I DO understand the learning curve and the costs to maintain (develop & KEEP & improve) a mobile app. Unaffordable for a little crew. I am so Thankful, to you guys, after a gap of 4-5 years I can now have secured way of writing diary. With paper diary, one is always scared and doubtful, what if it goes into other hands, even if that diary has a lock, but it is not hard to break that fragile lock. Then I saw many websites are available for making your online diary, yet I found them a bit too much interfering, somwhr you can’t write more than 750 words a day, somwhr you cant alter your previous entries, somwhr setup is too flashy with useless features like as if its a social blogging site and not a personal journal. I wanted something safe, very simple and not trying to interfere, which is what I found on Monkkee. God will bless you guys I saw the donation notification, I am looking for a job and I just got married few months back and migrated to a new city, looking at these circumstance, I apologize to not been able to make any contribution right now. But for sure, in future once I am stabilized, I would love to feed Monkkee. You guys who are makers of monkkee are very close to my heart, as you have provided me a safe and simple platform to talk to God, to vent out my problems and the list goes on. You guys are great. Same here. I came here just to thank them for this beautiful gift. No interference, no ads, no pressure for money nothing. It’s just exactly what is needed. Not more, not less. Heartiest thanks to the devs. Monkkee looks great, but I need offline writting, and then sync… a shame. But good work anyway. I think investing in a mobile app is not necessary. I have been adding my entries through my phoneS and I am actually quite enjoying it as there are no updates, interface changes and security risks. Simplicity is Monkkee’s strength. I have been telling all my friends about Monkkee (to the extent of becoming a little bit annoying :-). En revanche, having a place where I can put my thoughts feeling they will be safely stored (it is very important as when one is not sure of safety, one hesitates writing things down – in fact, it had been a major blocker for me until I discovered Monkkee), is important for journalling. So if you can even further strengthen the security, that would be an investment worth making. I have donated once, more will come as I reap the benefits of your great website. Monkkee est très rapide et grâce a son calendrier permet de voir les pages dans le temps. Il est très rapide et est protégé.